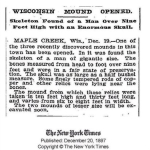 MAPLE CREEK, Wis., Dec. 22.- One of the three recently discovered mounds in this town has been opened. In it was found the skeleton of a man of gigantic size. The bones measured from head to foot over nine feet and were in a fair state of preservation. 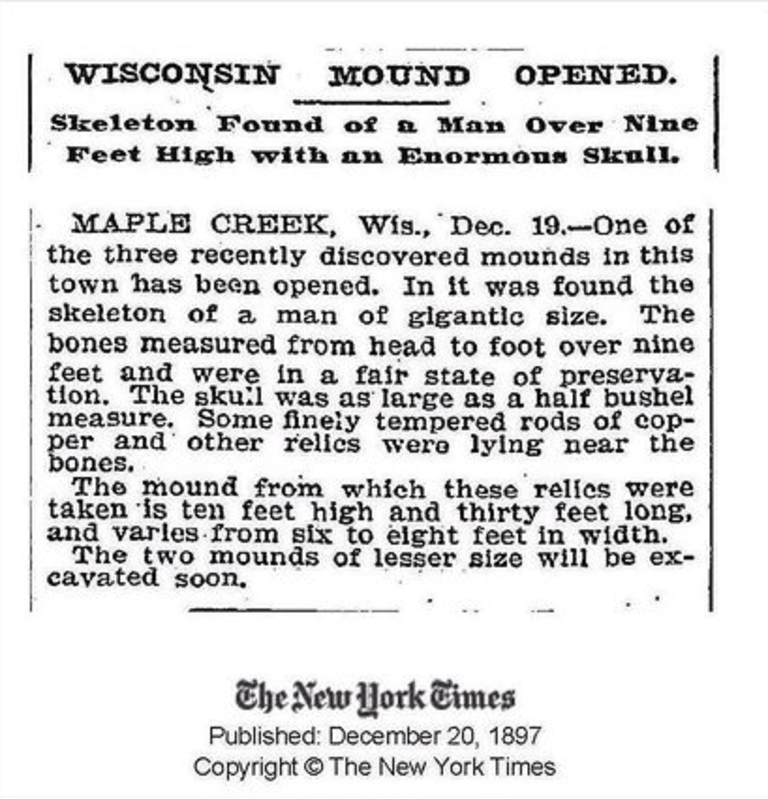 The skull was as large as a half bushel measure. Some finely tempered rods of copper and other relics were lying near the bones. Wisconsin Wisconsin. The mound from which these relics were taken is ten feet high and thirty feet long, and varies from six to eight feet in width. The two mounds of lesser size will be excavated soon. Wisconsin. Maple Creek is a town in Outagamie County, Wisconsin, United States. The population was 687 at the 2000 census. According to the United States Census Bureau, the town has a total area of 21.7 square miles. The Bible says that there were giants in the earth, Back in Gen;6:4, also David killed a giant with a sling shot. He was ten feet tall, so if they had them back in Bible times then we are now seeing the remains of a past race. Read “The Book of Enoch” to find out more about fallen angels that lay with women who then bore giants that slew men and this made God angry. We know the Bible is true, but why do these idiots think that the general public can’t handle such information? Yet they’re the people who have destroyed our nation and the world, of which you probably already knew.